The B-Mobile Fair goes on sale Friday 4/15/2011. Details here and the product page here (Japanese). If anyone has any specific questions about performance, please let me know in the comments section or via twitter and I'll include it in the testing. While in the Kanto region, I won't be able to test the upload speed to full capacity because Docomo has suspended high speed uploads following the earthquake, as you can see below. 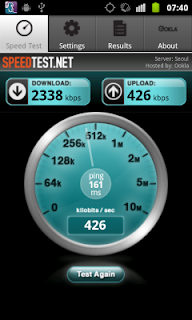 The downlink was in excess of 2 Mbps, but the upload is currently capped at standard speed. Why would you need 7.2mbps for the ports that they are allowing. (VOIP, Streaming, P2P etc is not allowed. I suppose that b-mobile 300kbps should be more than sufficient for Mail, Browsing and Messenger!! Is your IDEOS sim locked? yeah, daft isn't it, but wondering about a vpn? i have done a custom rom install on the ideos to see if it can solve my problem - couldnt save apn info. the mifi sim looks cool because it's the sameish price as bmobile but a lot faster - i'm a total data pig so it's important for me to have something like this - i don't think 1gb would last me as long as you. well the custom rom didn't help, and now i'm back to the same place i was when i started, no carrier signal bars. i solved this by installing a rom from the maker which was designed for japan (it said emobile on it). @1da6994ff47249d624b35af1273a6c28:disqus Thanks for sharing your thoughts. I agree with your assessment. @f19d8448fcc1eb51b4abc72a51e37ee4:disqus Sorry for the late reply.To address your question about bmobile v mifi:First, I think you are mixing things from two different products. The U300 is limited to 300 but has no data cap. The Fair is unlimited speed but has a 1000 MB cap that is good for 120 days (4 months). If you use 250 MB a month, then the Fair will last you 4 months. If you use 1000 MB a month, then it will only last accordingly.Second, the costs of each:B-mobile doesn't require a contract, though you can prepay for the U300 in 1/6/12 month intervals at 2980 or 2483/mont (the 12 month has no price advantage over the 6 month SIM). The U300 has no registration fee. The Fair costs 9800 yen to purchase and charges 8350 yen, so there is an initial first time extra cost of 1450 yen for the Fair.Mifi requires a contract (1 year or 3 months). In the case of 3 month, you pay 4725/month. The 1 year plan costs 3990/month. Each cost an additional 4200 up front.Third, every MVNO using FOMA are paying Docomo the same price. That is why they offer differing ways of packaging the data they resell to you. Some products are cheap, with no caps but limited in speed, others are completely unlimited but require signing up for long contracts, and yet others are unlimited in speed but capped in data. In the end they all pay the same amount of money to Docomo for the bandwidth you consume. This is why you really need to understand how you consume data to know which deal would be best. For example, if I used 600 MB every month, which is the most I have ever consumed in one month, then it would still be cheaper for me to use a bmobile Fair SIM (like I am now) rather than get the 3 month contract version of mifi. However, the mifi 1 year plan would be cheaper.So thinking that you are a data hog and knowing you are a data hog are different. Which are you really? Until Android 3.0 Honeycomb, it would seem that the OS wasn't designed with data-only SIMs in mind. The FOMA SIM cards that Docomo provides to MVNOs who in turn provide them to you lack certain components that Android 2.3 and lower expect to see. This results in all sorts of weirdness that I have outlined in various posts, such as 1) lack of network time and location services, 2) lack of signal bars on Android on 2.2 and lower, 3) lack of a 3G icon on 2.3, 4) lack of connectivity on 1.6 HTC firmware (i.e., it just doesn't work at all), 4) throwing up of "no network connection" errors by the browser when there really is a connection. Just because the browser threw up an error, doesn't mean it's not loading the page. Check the b-mobile label for over a years worth of posts, comments, and discussions regarding the U300 SIM and android. 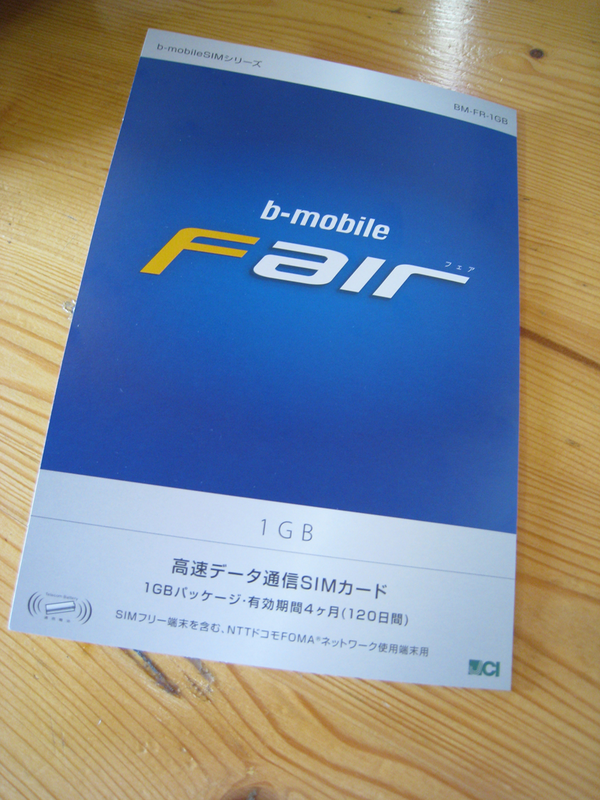 Check the later posts for my reviews of using the Fair SIM. The firmware on the b-mobile IDEOS works perfectly with the U300. the 3G or H icon is properly displayed. Network time works. Network location works. Signal bars are displayed. Unfortunately, this also means so are ads in apps. (One good consequence of these issues on my nexus one is that apps don't try and display adds when using the Fair SIM). thanks for the detailed post and rom info - will try to flash it tonight with that build although it has sp3 listed, not 2 - i assume that's a service pack. i am a total data hog, so 1gb probably wouldnt last me. i intend to tether my kindle and asus transformer to the phone so a faster connection would be better (or i'll be very frustrated loading pages at 20-30kb sec). Yes, I've used skype on ideos over wifi and it does work well enough. Be aware that Docomo data plans prohibit VoIP, which includes skype. scroll down to the bottom. All MVNOs (Rstream, BlueSIP, b-mobile, mifi) have to abide by these rules. Will skype actually work? Maybe. Maybe not.